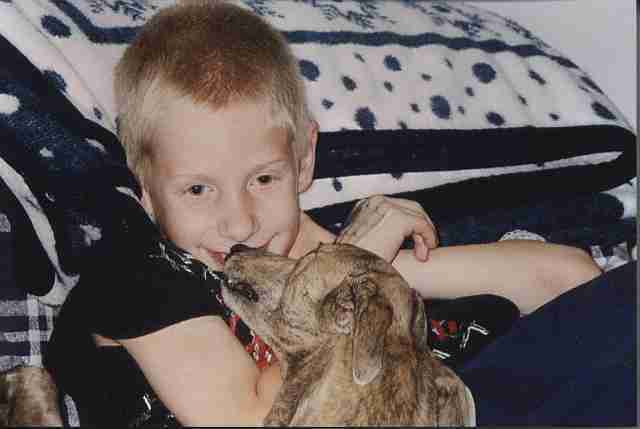 This is the story of a special little greyhound named Quesa (Kay-sa) and the extraordinary bond she shared with a little boy named Vinny. Quesa, age two, came to live with me in June, 2000. Vinny, age 8, lived next door. Vinny’s first meeting with Quesa was over the fence as he was initially intimidated by my little girl’s wild jumping and wiggling, and “in-your-face” welcome. Cautiously, Vinny learned that a gentle hand and soft voice would temper her energy and excitement at seeing him. I was amazed at how she would settle down, and look at him with adoring eyes. There was a connection between those two, for sure. But when he became more confident around her, she sensed his trust and she let him see her full blown energy and enthusiasm for life, and they had a great time running and playing in the yard. Vinny loved to stay overnight so he could spend more time with Quesa and my gentle giant of a boy, Toby. The hours before he fell asleep were full of rough play with my little 50-pound bundle of energy who loved to sit up and “box” with Vinny using her “kangaroo paws”. They would throw themselves on the couch and roll and play until she would flop herself into his lap and wiggle as close as she could get. Six months into their relationship, Vinny was diagnosed with leukemia. His primary care nurse in the Pediatric ICU said that their first conversations had to do, not with when he could go home, or how sick he felt, but with how much he missed his friend, Quesa. When Vinny was discharged from the hospital 19 days later, his only question about his continued care was when he could stay overnight with Quesa. Less than a day later, across my yard he was carried by his dad (as he was too weak to walk), frail, pale, skinny, and bald. At the window was Quesa watching with wagging tail and quivering body. When he came in, Quesa made her usual rush to him, but stopped cold, sniffed, and stiffened. Her nose immediately caught the scent of the antiseptic used to clean the tube implanted in his chest that would carry the chemo drugs directly into his blood stream. But then she sped into the living room and onto the couch to await his arrival and what she had come to expect as a rollicking good time. But Vinny did not throw himself on the couch with her, but stood next to it while Quesa sat up and batted the air with those mighty paws. He looked at me and asked me to make her stop since he was afraid that she would strike and dislodge the tube, which would not only be painful, but would put him right back in the hospital. I drew a breath and told him I could not make her stop; he would have to teach her not to play rough, that she didn’t know any better, silently considering calling his father to come for him until I could figure out how to keep him safe here. He thought about it for a minute and then slowly and carefully lifted his t-shirt to expose the tube and its clear protective covering. Quesa’s eyes glistened, her ears went erect, and she gently moved closer to sniff this new part of him. Vinny explained to her that he couldn’t play rough anymore because she might hurt him. Ears twitching, nostrils flaring, she never took her eyes from his face as he talked to her as if she was a person, explaining what had happened and why he was different. Somehow, some way, she understood. As I sat on the edge of the couch ready to nab her in an instant if she lunged at him, her body relaxed and she laid down in front of him, and put one paw carefully against his leg. Her eyes looked up at him and she sighed. Vinny eased himself down next to her. She very carefully crawled onto his lap, maneuvered onto her back and gently raised a paw to his face. He carefully patted her belly. That night they fell asleep together on the couch. She, not on top of him as she had done so many nights before, but nestled snugly between him and the back of the couch with that one paw placed precariously across his chest and his arm over her back. I checked on them several times during the night, and neither had moved. Quesa was very careful with Vinny once she knew he was ill. He and I would play UNO, or he would watch cartoons, or read his books, and she never moved. Once they settled down for the night, she never left his side. When they were together I did not exist. There was a special relationship between those two that I did not understand, and into which I was not encouraged to come. Vinny has now been in remission for 8 years, his hair has grown back, and he has regained the lost weight. He is getting ready to get his driver’s license. Quesa will soon be 11 and, although age has curbed her wild ways somewhat, she and her buddy next door still have that exclusive relationship. Vinny no longer stays overnight, but he does come to visit and they still “talk” over the fence. When they are together, I still do not exist, as that special relationship between those two remains beyond my comprehension, but not my awe. I have become a true believer in the unique bond they have. This story was originally written in 2009. Vinny is now 18 and a college freshman. Quesa crossed the bridge on 1/27/11 at age 13 1/2. Their friendship remains one of the most beautiful animal-child relationships I have ever witnessed. For a little boy who needed a friend to see him through some tough times, I am so thankful she was there for him, and that they allowed me to observe their world. 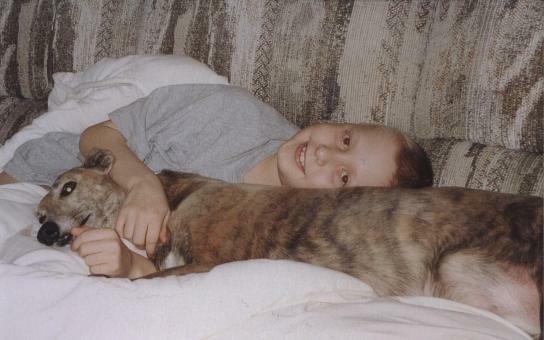 As I look back at their first meetings, I wonder if Quesa sensed (what took the rest of us months to find out) that Vinny was/would be a very sick little boy, and would need her support, and that is why she was so committed to him from the onset. 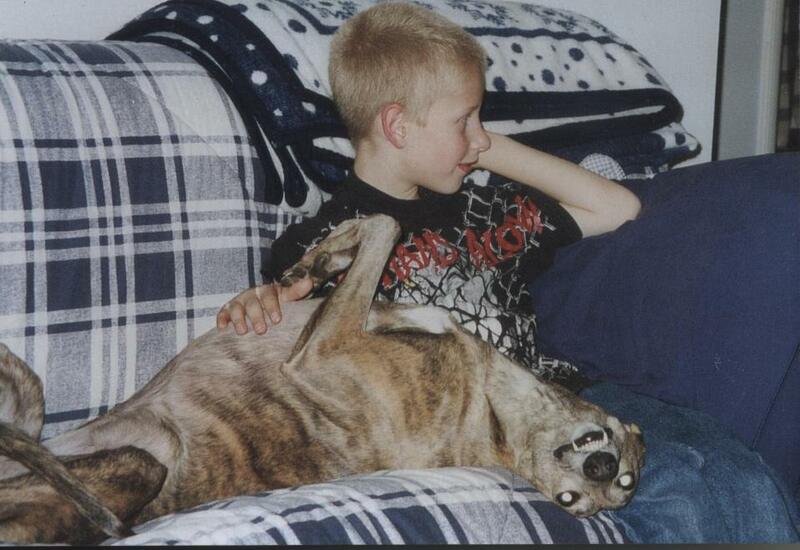 There was something about the two of them together that transcended the typical “boy and his dog” scenario. He was HERS, and she reacted towards him like she did to no other human being EVER in her life. 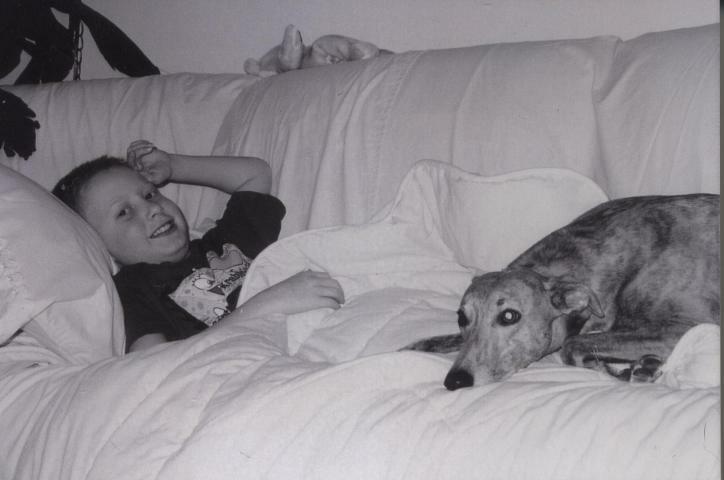 Quesa (Q’ue Sera Sera) was the little waif of a greyhound rescued by Kathleen and Gil Gilley in 2000. The vet who first examined her 38-pound emaciated and insect-bitten body, believed she would not make it through the night. But, the Gilleys took her home and, against all odds and predictions, nurtured her back to life. If there was a reason that this little lost dog was not to die from her abuse, malnutrition, and neglect, it was to take that 8-year old through a terrible time in his life…………..and to give me the joy of being her mom for nearly 11 years. R.I.P. Miss Quesa. You are surely missed.